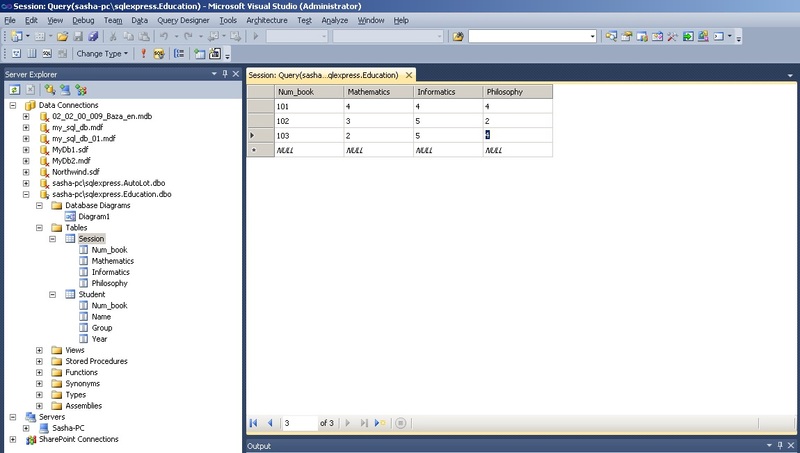 entering data to the tables using MS Visual Studio. 1. Run MS Visual Studio. 2. 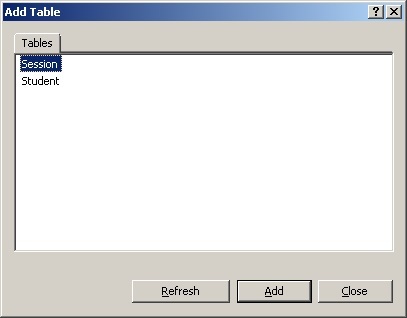 Activate the Server Explorer window. 3. Creating the database “Education”. 4. Objects of database Education. 5. Creating the table Student. 6. Creating the table Session. 7. Editing the structure of tables. 8. Making connections between the tables. 9. Entering data into the tables. 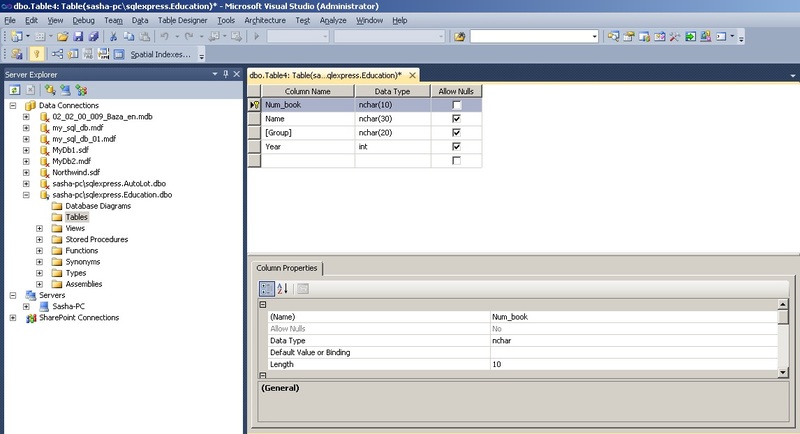 Using MS Visual Studio create a MS SQL Sever database named “Education”. Database includes two tables Student and Session. Tables are linked by some field. To work with databases Microsoft provides the lite database server Microsoft SQL Server. There are different versions MS SQL Server, for example: Microsoft SQL Server 2005, Microsoft SQL Server 2008, Microsoft SQL Server 2014 and others. You can load these versions from the site Microsoft www.msdn.com. This server is excellent for working with databases. It is free and has a graphical interface for creating and managing databases using SQL Server Management Tool. After calling, the “Server Explorer” window will have the approximate view as shown in Figure 2. 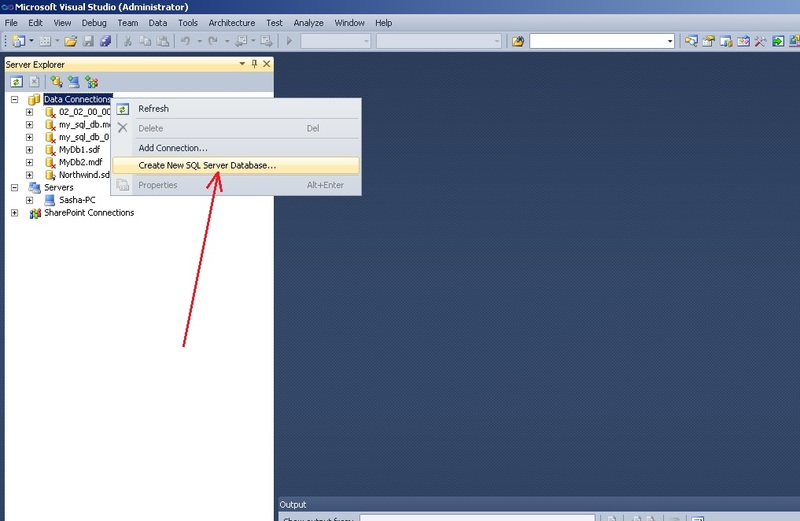 To create a new database, that is based on the provider Microsoft SQL Server, you need to click on the “Data Connections” node. 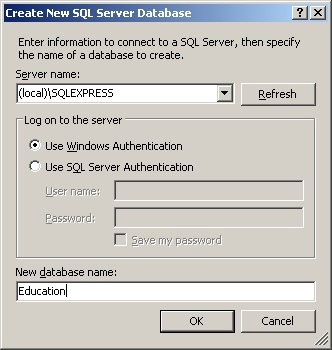 Then you need to select “Create New SQL Server Database …” (Figure 3). 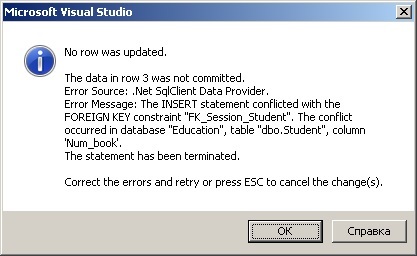 As a result, the window “Create New SQL Server Database” will be opened (Figure 4). 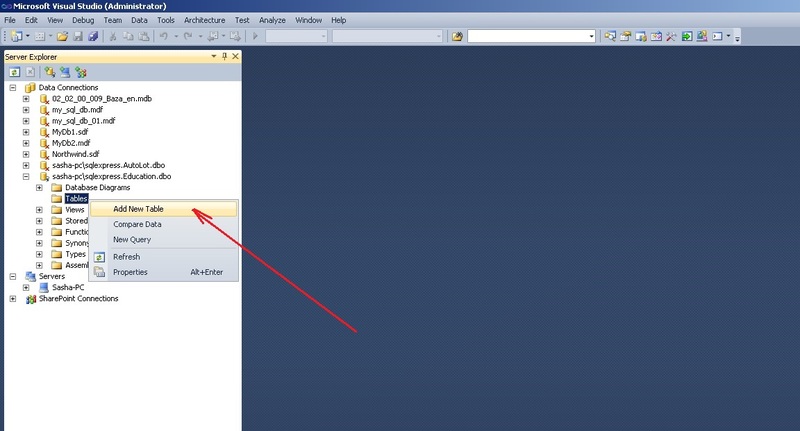 In the window (in the «Server Name» field) is indicated the local name server installed on your computer. In our case this name is “SQLEXPRESS”. In the field “New database name:” you need to specify the name of database, which will be created. In our case this name is “Education”. “Use Windows Authentication” option must be left unchanged. Stored procedures. They represent a group of related operators in the SQL language, which provides additional flexibility when working with the database. 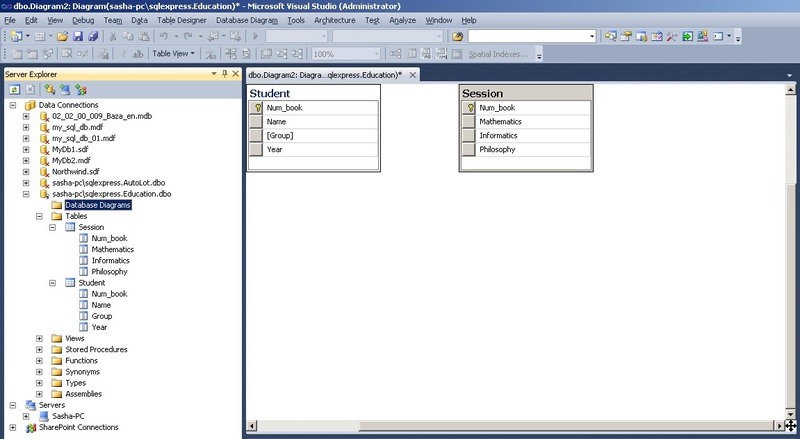 At present, database “Education” is empty and doesn’t contain any objects (tables, stored procedures, views and so on.). 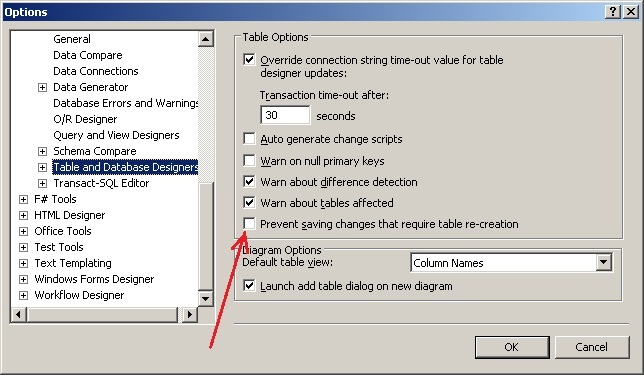 To create a table, you need to call the context menu (click of right button mouse) and select the command “Add New Table” (Figure 6). Figure 7. Alternative adding a new table. As a result, the window of adding a new table will be opened. This window contains three columns (Figure 8). 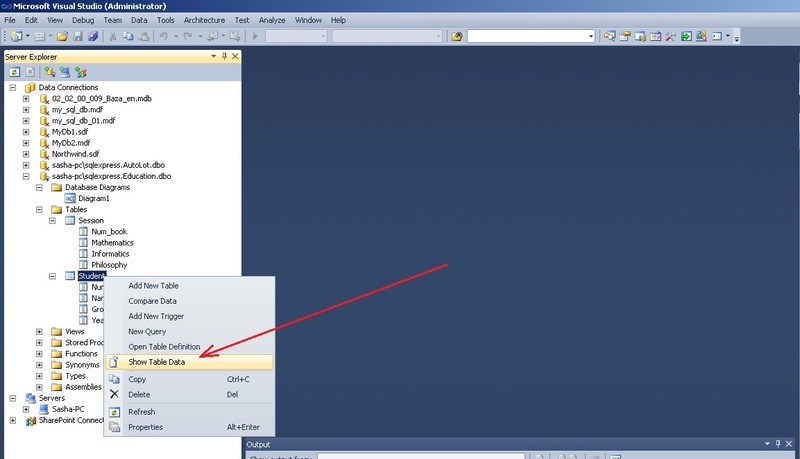 In the first column “Column Name” you need to enter the title of corresponding field of database table. 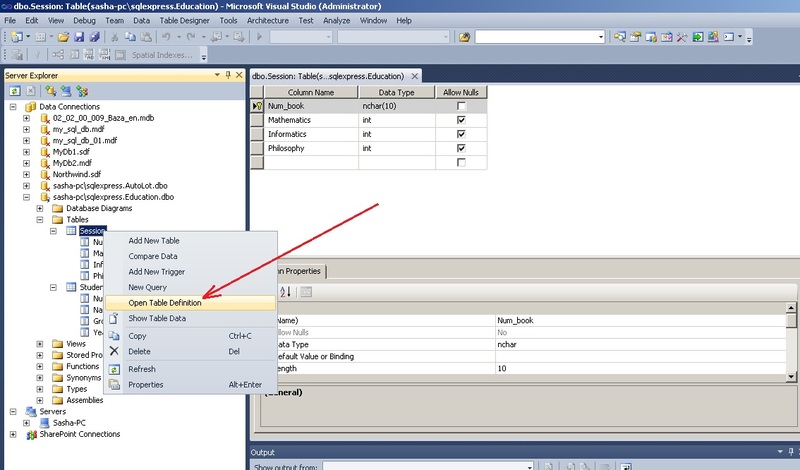 In the second column “Data Type” you need to enter the data type of this field. 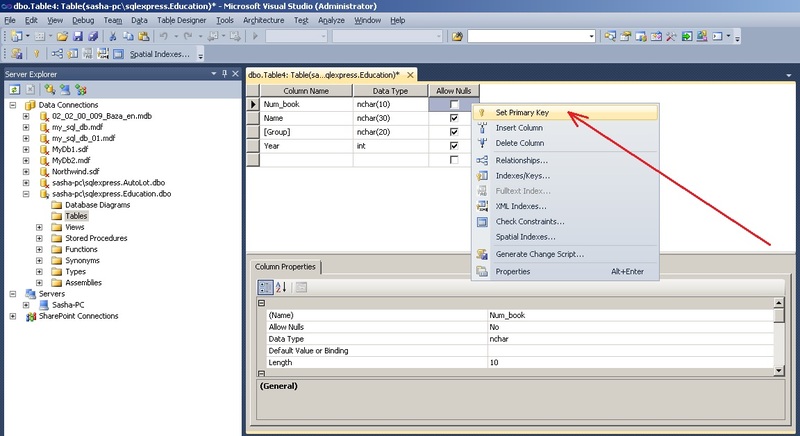 Third column “Allow Nulls” indicates the option of the possibility of a lack of data in the field. 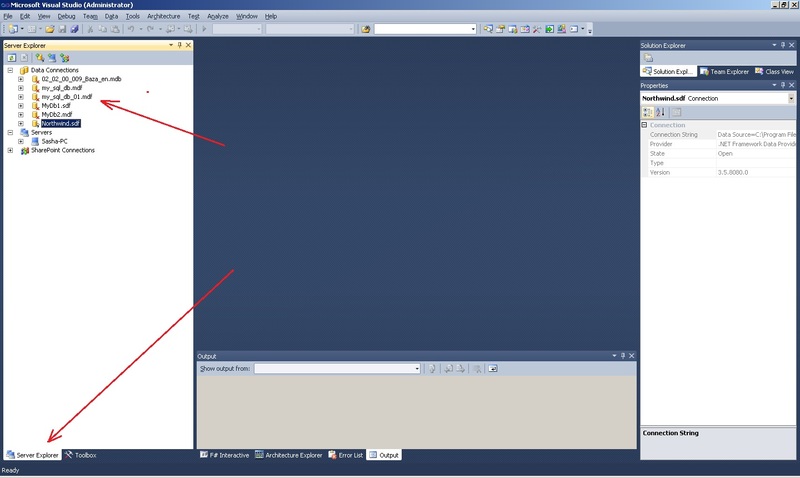 By using the table editor you need to form the table Student as shown in Figure 9. The table name must be set when it is closing. 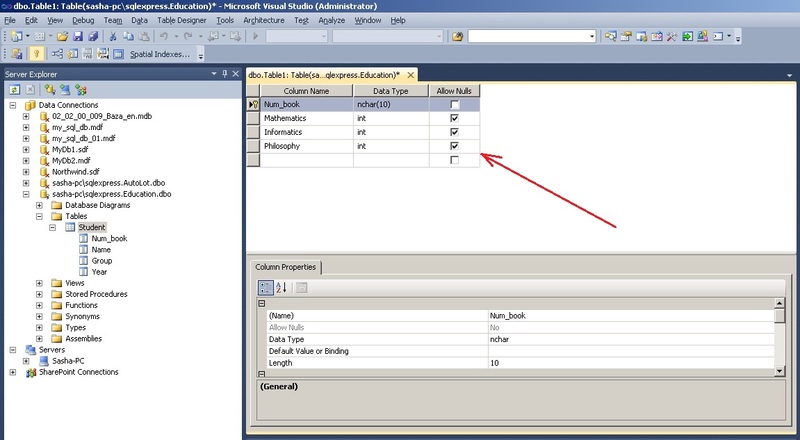 In the editor table you can set the properties of fields in the “Column Properties” window. To set length of string (nvchar) in the symbols, in the window Column Properties need to use property Length. By default the value of this property is 10. Next step you need set the key field. It is realized by calling command “Set Primary Key” from the context menu of field Num_book. By using the key field will be set the relationships between tables. In our case the key field is the number of test book. After setting the primary key the window of table will have the following view (Figure 11). Now you can close the table. In the window of saving the table you need set the it’s name – Student (Figure 12). Following the model of creating a table Student is created table Session. At the Figure 13 the view of table Session is shown after final formation. Primary key is set in field Num_book. The name of table is set as “Session”. 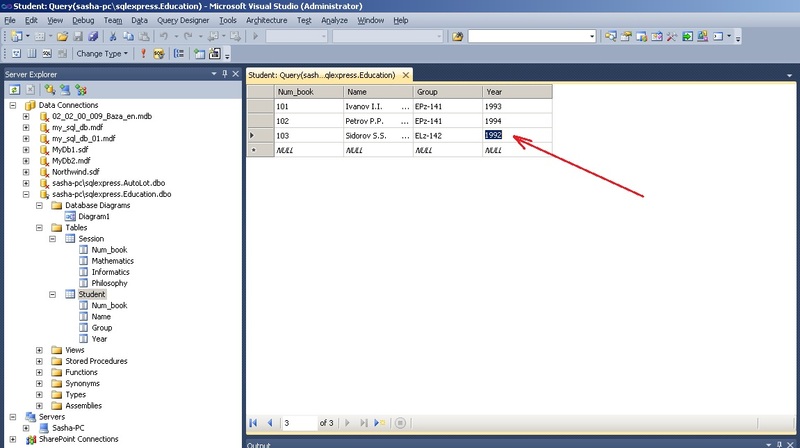 After performing steps, in the “Server Explorer” window will shown two tables Student and Session. Thus, in the database you can add any number of tables. There are cases when you need to change the structure of the database table. After settings you can change the structure of tables. 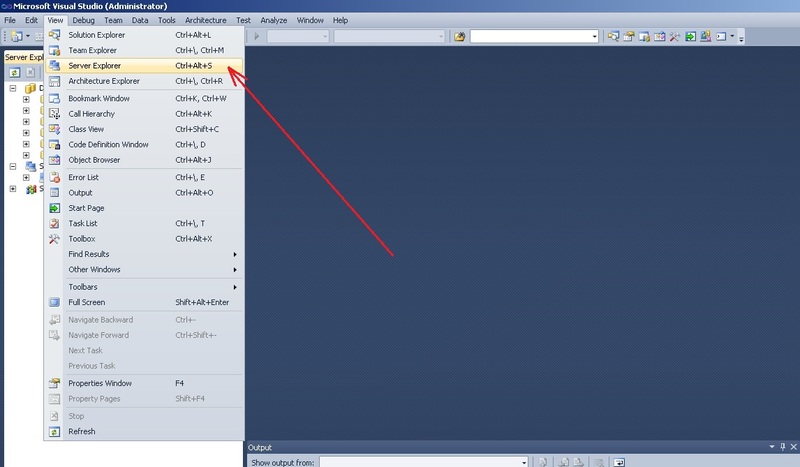 To do this you can use command “Open Table Definition” (Figure 15) from the context menu, that is called for selected table. Previously you need select the table. 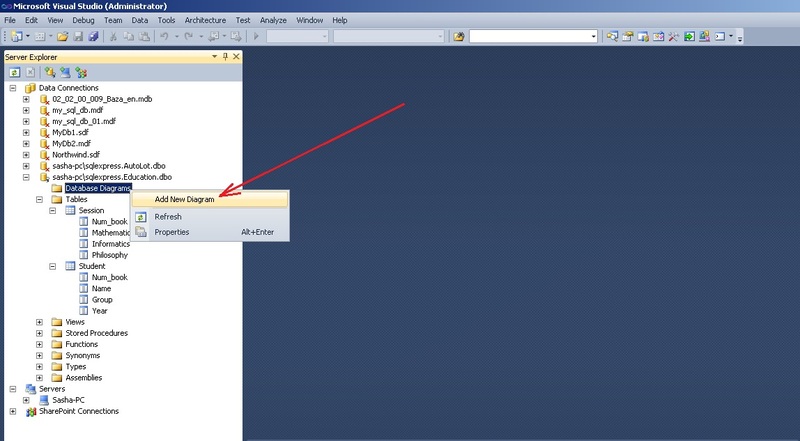 select command Add New Diagram from the context menu (or menu Data). As a result, the window of adding new diagram “Add Table” (Figure 17). 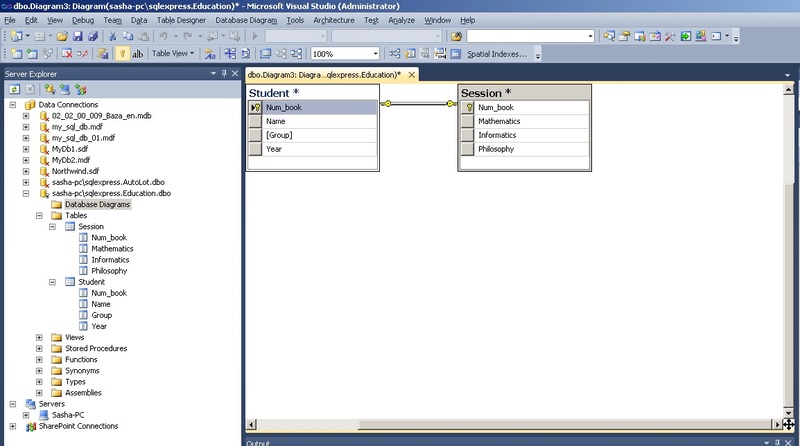 In this window you need to select two tables “Student” and “Session” and press the “Add” button. 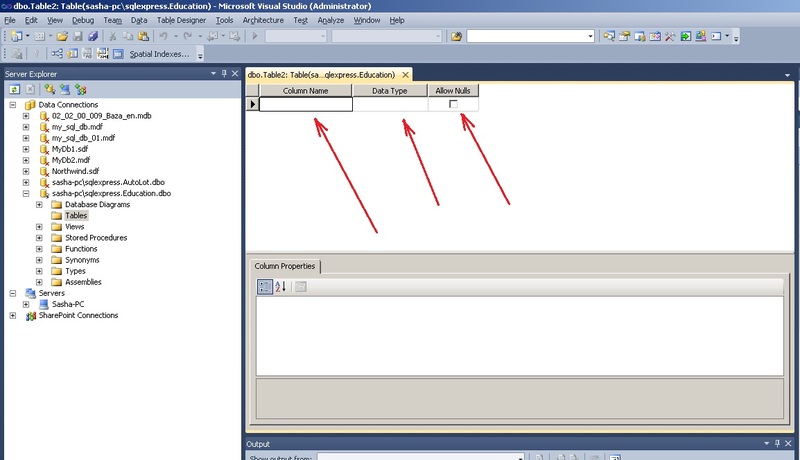 To set the relationship between tables, you need click on the field “Num_book” of table Student and then (holding down the mouse button) drag it to the field “Num_book” of table Session. 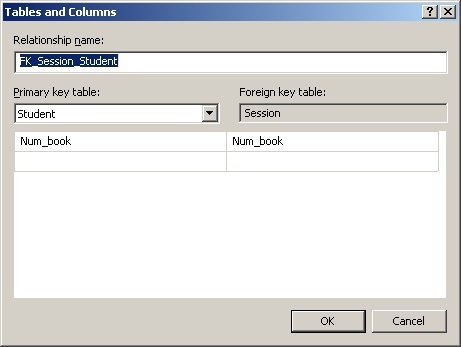 As a result, will be opened two windows: “Tables and Columns” (Figure 19) and “Foreign Key Relationship” (Figure 20). In these tables you need leave all as it is and confirm your selection by clicking at “OK” button. 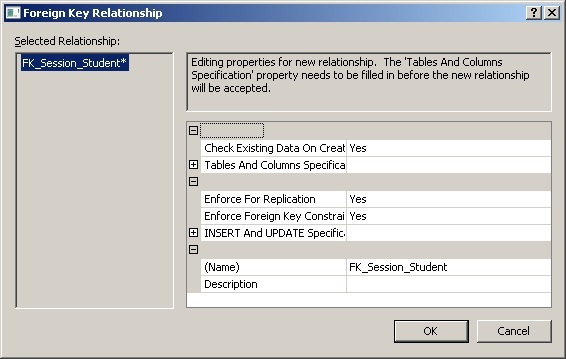 In the window “Tables and Columns” is set the title of relation (FK_Session_Student) and name of parent table and child table. After that the relationship between tables (Figure 21) will be set. Saving the diagram is in the same way as saving the table. You need choose the diagram’s name at your discretion (for example “Diagram1”). At the next step, the window “Save” will be opened. In this window you need to confirm your choice (Figure 22). 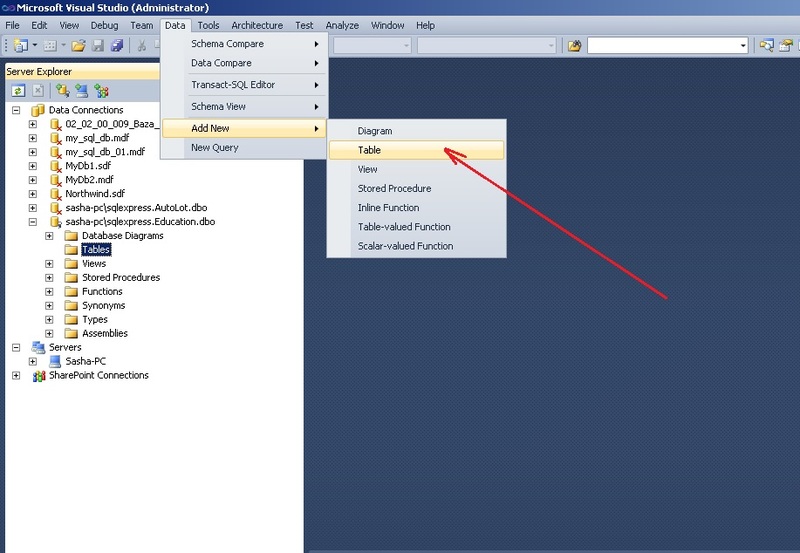 Microsoft Visual Studio allows you to enter data into the tables directly. In our case, when you set the relation (Figure 19), the table “Student” is realized as primary table (“Primary Key Table”). 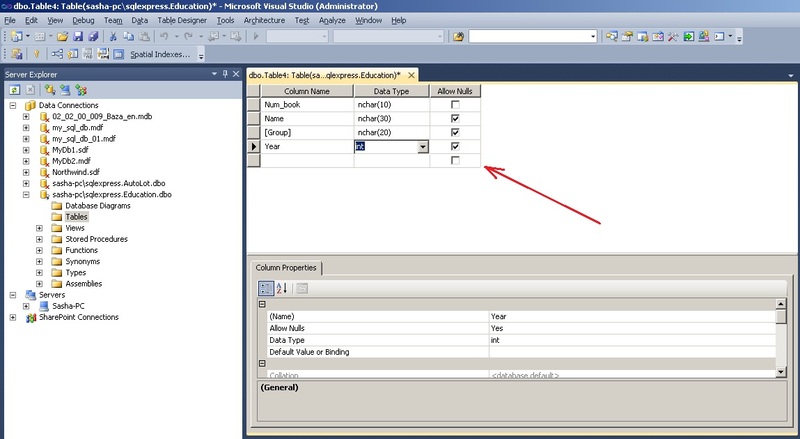 Therefore, first of all you need enter data in cells for the table “Student”. 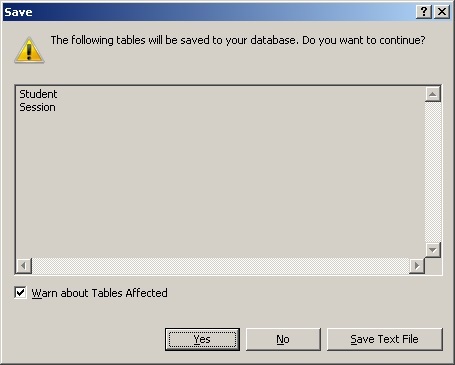 If you, first of all, will try enter data into the table Session, the system will block entering and will shows the corresponding message. 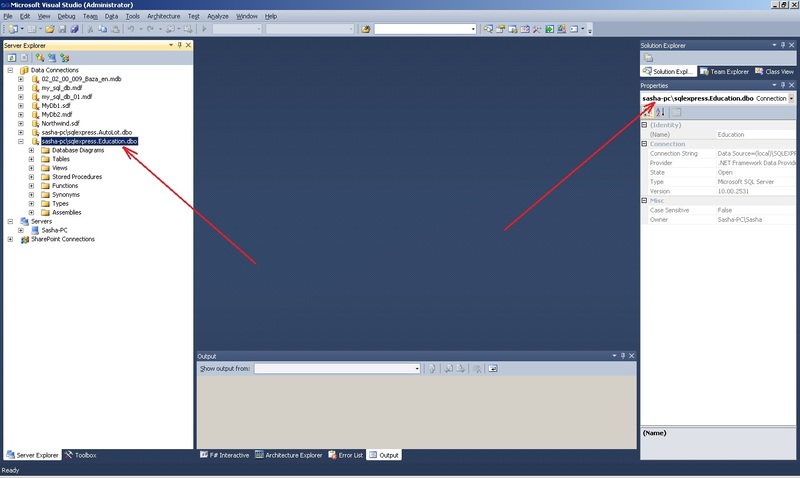 To access the data entry mode in the Student table, you need to call the command Show Table Data from the context menu (click by right mouse button) or from Data menu (Figure 23). The window, where need to type data, will be opened (Figure 24). After entering data in the Student table you need to enter data in the Session table. When you entering data to the field Num_book of Session table you need to enter exactly the same values, which entered in the field Num_book of table Student (because these fields are linked themselves). For example, if in the field Num_book in the table Student enter values “101”, “102”, “103” (see Figure 24), then you need enter exactly these values in the field Num_book in the table Session. If you try enter other value then system will display approximate the following window (Figure 25). Table Session with entered data is shown in Figure 26. So, database created. Inputting and processing of data in the tables can be implemented by using a programming.